Just like Jacques Cousteau dove deep into the ocean to reveal the secrets of the underwater world to his audience, a writer has the freedom to go into depth when covering a topic in a long format. Short posts require clear answers, and some questions are too complex to be summarized without having to leave out some valuable information. There’s no better way to establish your company as an expert in a certain field than putting your content where your mouth is. Long posts can tackle methods and techniques in greater detail, argue different viewpoints, and provide deeper insight into a certain topic. 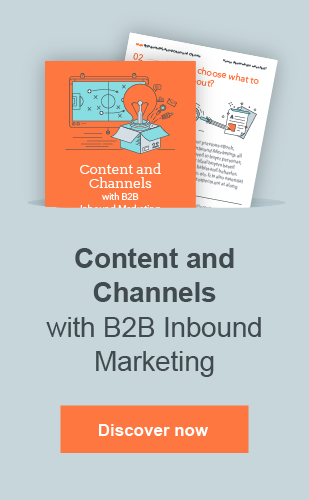 Content assets like guides are one of the most valuable content types, and the audience shows their gratitude by sharing, which brings us to point number three. Since it takes more time and effort to write a long post, it doesn’t come as a surprise that people associate long posts with quality. We’re living in a world where around 2 million blog posts get published daily, and it’s not easy to stand out from that much competition. As longer blog posts are less common, readers are much more likely to share a great piece as it not only can add value for their network, but it it helps to boost their own credibility too. Long posts rank better in Google. The simplest explanation is that there is more room for keywords (especially long-tail keywords), visual assets, headings, and other components that contribute to the text ranking for a particular keyword. The more words there are, the easier it is for Google’s algorithm to determine the topic and quality of the text, increasing the chances for your blog post to rank high in search results. Perhaps one of the best traits of long posts is that they can be repurposed into a bunch of other content types; from a series of short posts to infographics or videos and other visual aids. Parts of long posts, such as quotes or graphs, can be reused as teasers for social media channels. Procrastination is the archnemesis of every writer, and the larger the scope of the project is, the greater the force of procrastination is going to be (some scientists claim it works similar to gravitational force). 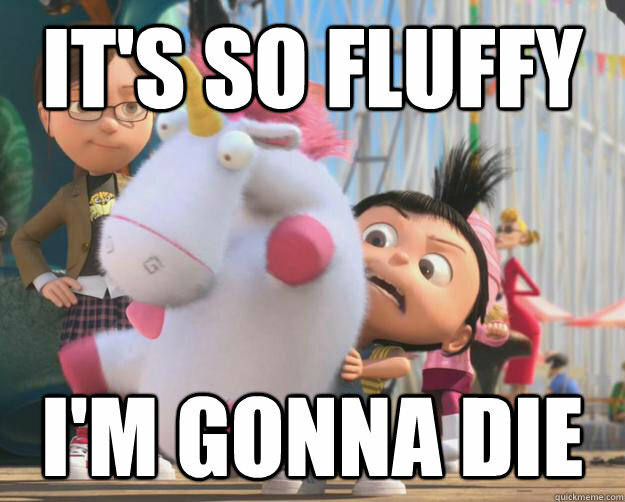 Unless you want your post so filled with fluff that your readers will want to cuddle with it instead of reading it, there has to be a solid structure to it, which can be especially demanding for long posts. 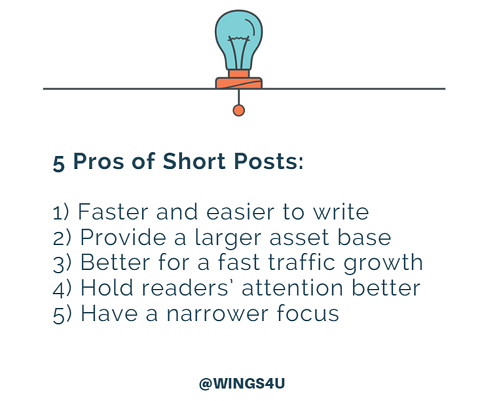 Short posts are easy to produce as they don’t require as much research and planning as their longer counterparts. Another benefit is that you don’t have to threaten to fire your writer to motivate them to finally finish a gargantuan piece (any resemblance to reality is pure coincidence). If your blog has a wealth of content, you have the privilege of being able to experiment with different asset lengths. However, if you’ve just started building your content base, it’s also important to focus on quantity while keeping quality in mind. 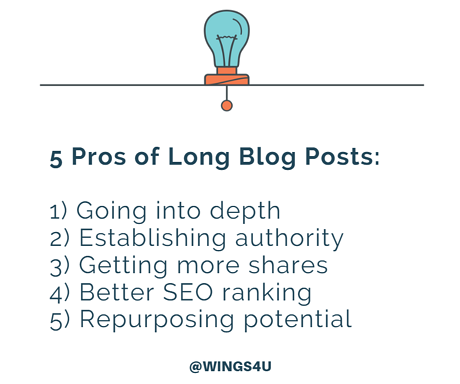 Three short posts make your blog look richer compared to one long post, and the audience often connects the size of the content database with the quality and authority of the blog. Looking to grow your traffic quickly? Having a large number of posts to promote gives you more opportunities to communicate with your audience on a number of content distribution channels; whereas it gets challenging to keep promoting the same long blog post over and over again. 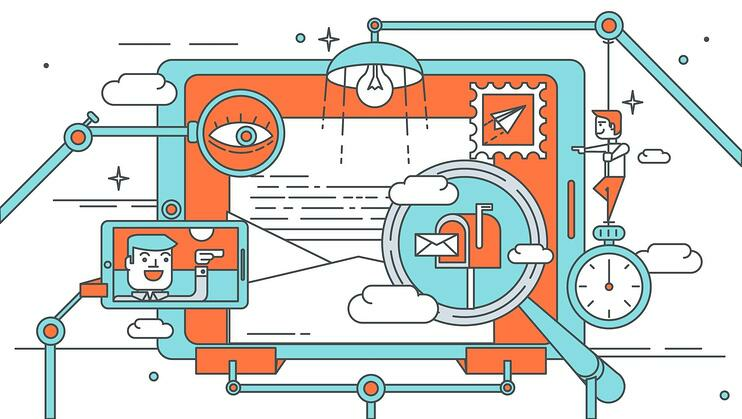 There’s no arguing that a long article can be a real “page-scroller” that captivates the reader’s attention from the title to the CTA, but in reality, most people lose interest along the way. It might have something to do with the fact that the average attention span has been decreasing over the years and has gotten lower than that of a goldfish. Unfortunately, as goldfish can’t be your target audience because of their poor reading skills, you’ll have to work with humans who will scan your content in less than 9 seconds before deciding whether to read it or to check their social media profile. A lengthy post might scare some people away or have them save it for later, which usually never happens. Short posts are easy to digest, and some websites even display the estimated reading time for each piece, and 3-5 minutes doesn’t seem like too much time to dedicate to an article or post. Sometimes all a reader needs is the answer to “what is X” or “how do I do Y”, which doesn’t require an equivalent to War and Peace in terms of length. Short posts are perfect for answering questions directly, defining basic terms, or comparing two options (like this one). Since things aren’t black and white and both short and long posts have their advantages and disadvantages, it all boils down to testing the waters and discovering what works best with your audience. If you’re targeting busy CEOs, good luck with getting a good CTR for a 5000-word post; but do also keep in mind that people who are more knowledgeable in the topic you’re writing about will prefer to read longer posts that provide detail and a deeper analysis. For concrete advice on the type of posts to use for your company, feel free to contact us and we’ll be glad to help.